American 8-Ball Pool, is one of the best free pool games with US 8-ball pool and straight pool Tournamants, Challenges & Time Attacks. Win the cups to become the pub pool champion, and win trophies for top scores, big breaks and special shots. Play 8-ball pool against the computer, American 8-Ball Pool is one of the best 8-ball pool games on the web. Play 8-ball pool tournaments against computer players that are clever and quick thinking, making American 8-Ball Pool one of the best 8-ball pool games with computer players. 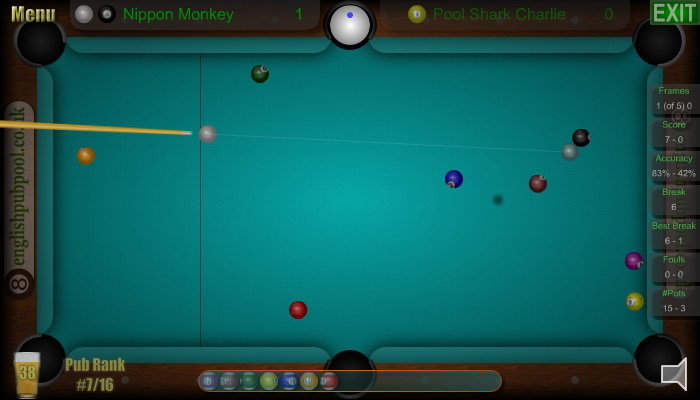 American 8-Ball Pool is one of the best flash 8-ball pool games online. It is a fast paced 8-ball pool game where you can play 8-ball pool and straight pool tournaments and challenges. Win over 50 medals for your achievements as you play the cups, Challenges and Time Attacks. All of your pool stats and top scores are automatically saved for you. It has simple controls, great physics and quick thinking computer players with addictive game play - Enjoy! Play American 8-Ball Pool on Facebook - with special facebook achievements, daily prizes and more. You can share your pool scores with your facebook friends to see who rules the table. 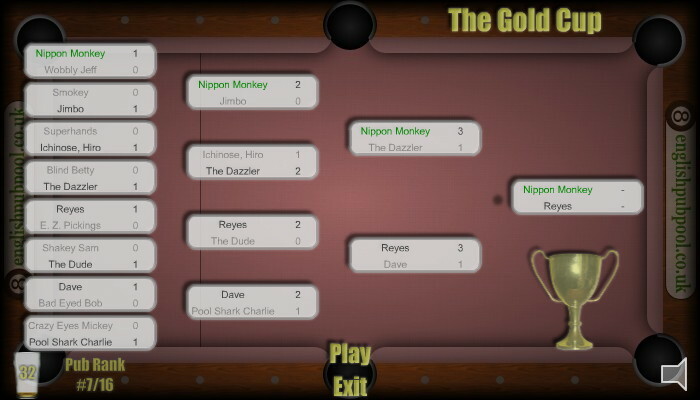 American 8-Ball Pool was developed by Nippon Monkey for englishpubpool.co.uk and american8ballpool.co.uk.